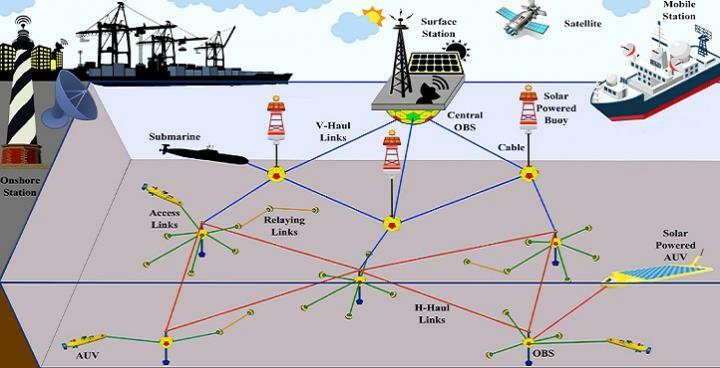 Oceanic sensor networks that collect and transmit high-quality, real-time data could transform our understanding of marine ecology, improve pollution and disaster management, and inform the multiple industries that draw on ocean resources. A KAUST research team is designing and optimizing underwater wireless sensor networks that could vastly improve existing ocean sensing equipment. "Currently, underwater sensors use acoustic waves to communicate data," explains Nasir Saeed, who is working on a new hybrid optical-acoustic sensor design with colleagues Abdulkadir Celik, Mohamed Slim Alouini and Tareq Al-Naffouri. "However, while acoustic communication works over long distances, it can only transmit limited amounts of data with long delays. Recent research has also shown that noise created by humans in the oceans adversely affects marine life. We need to develop alternative, energy-efficient sensors that limit noise pollution while generating high-quality data." "Using our technique, the sensors transmit their received signal strength information (RSSI) to the surface buoy," says Saeed. "For a large communication distance, the sensors use acoustic signals, but if the sensor is within close range of another sensor, it will send an optical signal instead." Alouini's and Al-Naffouri's teams propose that their sensors will require a new energy source rather than relying on short-term battery power. They envisage an energy-harvesting system that powers fuel cells using microscopic algae or piezoelectric (mechanical stress) energy.